created from a twill w., typically from cross one-row or stitched twill; may also be of arbitrary composition. Forms a relief surface on the fabric, usually in a design of small squares, the contours of which are raised and the centres deepened. 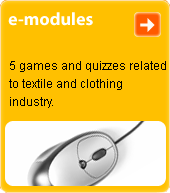 Used in cotton fabrics (eg., hand towels), and (less so) in woollen fabrics.